Could this be the year Gonzaga finally breaks through to the Final Four? The Zags are tourney-bound for the 19th year in a row, but have only matched their 1999 Elite Eight run once (2015). With five double-digit scorers, the one-loss Bulldogs are poised for a deep tournament run and could finally be playing on the tournament’s third weekend. WhatIfSports.com foresees more heartbreak in store for the Bulldogs. 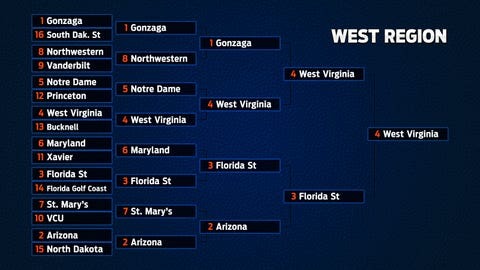 In 1,001 simulations, Gonzaga cruised into the Sweet 16 with a West Region-best 66.3 winning percentage, but West Virginia proved to be a tough opponent in that round. 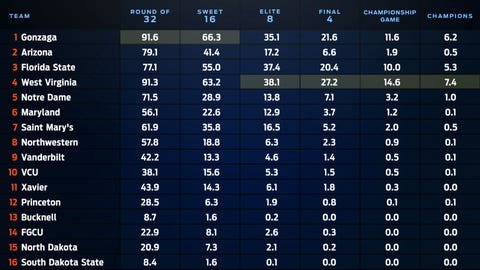 The Zags still advanced to the Final Four in 21.6 percent of simulations, but the odds aren’t as rosy as the Mountaineers’ (27.2 percent to advance to the Final Four). Gonzaga’s 6.2 percent chance to cut down the nets ranks last among No. 1 seeds, but is still sixth-highest overall. Arizona used the Pac-12 Tournament to avenge two of its four losses on the season, knocking off UCLA in the semifinals and Oregon in the championship game. Depending on how the bracket shakes out, the Wildcats may play Gonzaga in the Elite Eight with the opportunity to get even for the Zags’ 69-62 victory over Arizona in December. Should the meeting take place, Arizona will be bolstered by the addition of Allonzo Trier to its roster. Trier missed the first 19 games of the season but has led the Wildcats with 17.3 points per game since his return, connecting on 41.4 percent of three-point tries and 80.0 percent of free throws (6.7 attempts per game). Arizona is not a favorite of WhatIfSports.com’s simulation engine. The Wildcats’ 6.6 percent chance to reach the Final Four ranks well behind Gonzaga (21.6 percent), Florida State (20.4 percent) and West Virginia (27.2 percent). Even No. 5 Notre Dame (7.1 percent) has better Final For odds than Arizona. With two wins over Miami and a nonconference victory over the ranked Florida Gators, the Seminoles owned the state of Florida this season. Conveniently, they’ll head 260 miles down the road to Orlando for the first round. However, another Florida school awaits, and it’s just a 140-mile trip for Florida Gulf Coast. Sophomore Dwayne Bacon, from Lakeland, FL, will look to defend his home turf for the Seminoles. The 6’7” guard paces the Florida State attack with 16.9 points per game. Among No. 3 seeds, only UCLA (13.7 percent) has better title odds than Florida State’s 5.3 percent chance. The Seminoles are one of seven schools with a +20 percent chance to reach the Final Four, but two of the others — Gonzaga and West Virginia — share the West Region with the Seminoles. The simulation definitely favors Florida State in a potential Sweet 16 matchup with Arizona, as the Seminoles have a 37.4 percent chance to advance to the Elite Eight, compared to Arizona’s 17.2 percent chance. No team causes more chaos for an opposing backcourt than West Virginia. The Mountaineers lead the country in steals (10.4 per game) and turnovers forced (20.4). It’s a strategy that tripped up several top-ranked teams this year, including No. 6 Virginia, No. 1 Baylor, No. 2 Kansas and No. 24 Iowa State. Guard Jevon Carter is the team leader at 2.6 steals per game, but he’s joined by four teammates averaging a steal or more per contest. 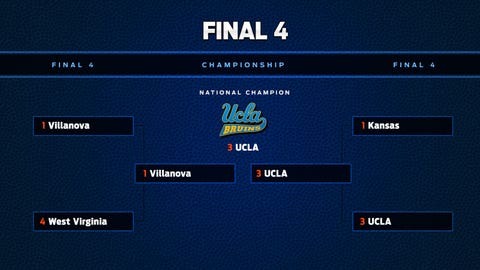 WhatIfSports.com likes the havoc to take West Virginia all the way to the Final Four. In 1,001 simulations, West Virginia advanced out of the West Region 27.2 percent of the time and won the title 7.4 percent of the time, fifth-best of all teams.